Affordable rental housing can be hard to find in the Hamilton area, and Indwell (formerly Homestead Christian Care) is addressing the need by building Rudy Hulst Commons, a permanently affordable housing complex in Hamilton’s East End. The block will also house Indwell’s new headquarters and street-level commercial units. 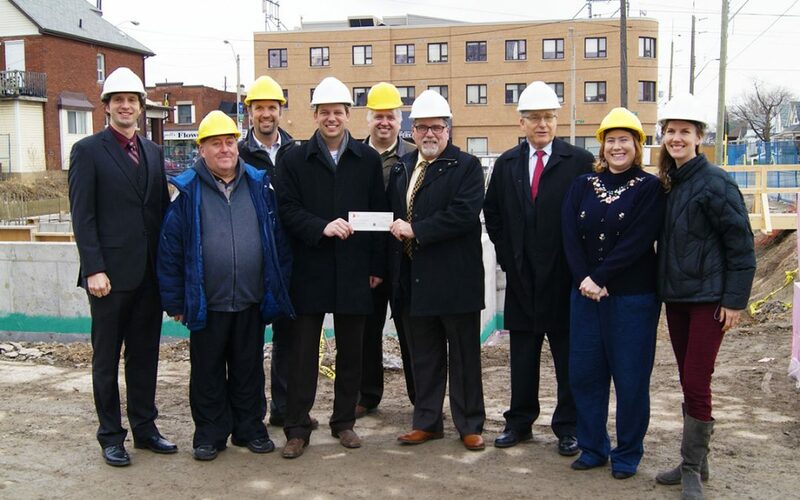 Indwell received an early Christmas present on Tuesday, December 9, when the REALTORS® Association of Hamilton-Burlington (RAHB), on behalf of its members and the Ontario REALTORS Care® Foundation, handed over a cheque in the amount of $15,000 for Rudy Hulst Commons. The REALTORS® Association of Hamilton-Burlington represents more than 2,700 real estate brokers and sales representatives from the Hamilton, Burlington and outlying areas. RAHB subscribes to a “Quality of Life” philosophy which promotes the creation of vibrant, complete communities for the benefit of all residents. Indwell is a Christian charity that creates affordable housing communities that support people seeking health, wellness and belonging. Their programs support 250 households in Hamilton and Woodstock. The REALTORS Care® Foundation provides grants to Ontario shelter-related charitable organizations, and since its inception has granted more than $3 million to Ontario charities. The REALTORS Care® Foundation is supported by Ontario real estate associations and REALTORS®.